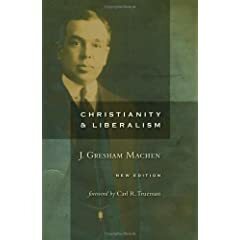 Christianity and Liberalism by J. Gresham Machen is one of those books I turn to again and again. Who is not stirred by passages such as “After listening to the modern tirades against the great creeds of the Church, one receives rather a shock when one turns to the Westminster Confession, for example … and discovers that in doing so one has turned from shallow modern phrases to a ‘dead orthodoxy’ that is pulsating with life in every word. In such orthodoxy there is life enough to set the whole world aglow with Christian love.” Who can fail to echo Machen’s prayer “God send us ministers who instead of merely avoiding denying the cross shall be on fire with the cross, whose whole life shall be one burning sacrifice of gratitude to the blessed Saviour who loved them and gave Himself for them.” Who does not know from sad experience the truth that “[Under liberalism] the only authority, then, can be individual experience; truth can only be that which ‘helps’ the individual man. Such an authority is obviously no authority as all; for individual experience is endlessly diverse, and when one truth is regarded only as that which works at any particular time, it ceases to be truth. The result is an abysmal skepticism.” The message of Christianity and Liberalism is as needed in our day as it was when Machen wrote it – if not more so! Reading through my notes on C&L recently I was particularly struck by one sentence “The present is a time not for ease or pleasure, but for earnest and prayerful work.” In the wealth and freedom of our western reformed Churches, and in my own life, do the scales balance on the side of “ease and pleasure” or on the side of “earnest and prayerful work”? Anyway, this was a challenge which gave me pause for thought. To keep this rambling post related to the topic of the thesis here are some quotes from C&L which touch on the proclamation of the free offer of the gospel. From the beginning Christianity was a campaign of witnessing. The old theologians recognised … the … doctrine of “common grace.” There is something in the world even apart from Christianity which restrains the worst manifestations of evil … it is certainly a great principle. If we really love our fellow-men we shall never be content with binding up their wounds or pouring on oil and wine or rendering them any such lesser service. We shall indeed do such things for them. But the main business of our lives will be to bring them to the Saviour of their souls. Every man who has been truly redeemed from sin longs to carry to others the same blessed gospel through which he himself has been saved. The propagation of the gospel is clearly the joy as well as the duty of every Christian man.